2016 Record Store Day exclusive! 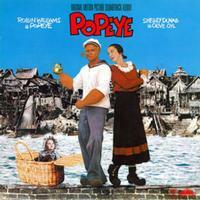 This was the first official vinyl reissue of the "Popeye" soundtrack, with music and lyrics by Harry Nilsson. The soundtrack features vocals by the stars of the 1980 film, Robin Williams, Shelly Duvall, and Ray Walston, and this reissue also features two previously unreleased score cues, sourced from original analog stereo master tapes.